Visitors to the Western Lake District can be both shaken and stirred this November, as they celebrate the birth month of the most famous spy in the world, alongside some of the slick and glamorous cars that gave him his iconic status. The 'James Bond Collection of vehicles' has licence to thrill at the fantastic Keswick-based attraction, Cars of the Stars, home to some of the most well known motorised vehicles from film and TV over the last four decades. The museum is both privileged and proud to own this James Bond Collection, rotating the cars on display from this collection on a continuous basis, to create new things to see at every visit. The museum is always happy to confirm which cars are on show at any one time, if visitors wish to ring up and check. 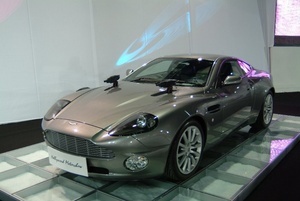 Think of 007 behind the wheel and an Aston Martin springs to mind - one of the reasons why the museum is currently showcasing the beautiful Aston Martin Vanquish, from Die Another Day. It’s not all about cars in this super collection, with other gems being the Cagiva motorcycle ridden by Pierce Brosnan in Goldeneye and the BSA Rocket Firing Motorcycle, as featured in Thunderball. As the cars on display rotate, Bond fans could see a number of vehicles, including some from Bond's adrenaline-filled chase sequences. These include the 1971 Ford Mustang MACH, famous for a two wheel skate in a Las Vegas alley, in Diamonds Are Forever, with Sean Connery at the wheel. The museum’s white Lotus Esprit Roadcar was the actual car used in the chase sequence of The Spy Who Loved Me as it evades Caroline Munro in her helicopter, by driving off a pier and converting into a submarine fitted with mines and rockets. This is another vehicle that, when on display, certainly has the cameras clicking. Cars of the Stars is not just a place in which to view cars from the Bond Collection, as it is also home to famous vehicles such as Chitty Chitty Bang Bang and Batmobiles, to name but a few. If you’re nuts about Bond and iconic cars and motorbikes that have featured on the silver screen, or TV you can visit Cars of the Stars seven days a week, from 10-5pm. Admission costs £4.00 for an adult and £3.00 for children. More details can be found at http://members.aol.com.